The most compelling site in Quetzaltenango is the Xela Historic Centre, the old colonial town. Rich with culture, architectural gems and appealing tourist attractions, Xela is a reminder of the city's prosperous past as a coffee exporting and trading hub. The laid-back ambiance of this charming district is a joy. The heart of the city is the Parque Centro America (Central America Park), surrounded by glorious colonial buildings and attractions. Tourists sightseeing in Quetzaltenango may like to take in a performance at either the Teatro Municipal (Municipal Theatre) or the Teatro Roma (Rome Theatre). If you are here with children, then the Parque Zoologico Minerva (Minerva Zoo) on the Avenida Las Americas is a good place to spend some time. 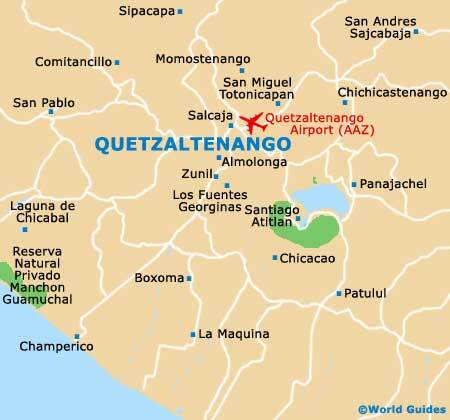 Quetzaltenango is divided into two cities, the original colonial town and the new, modern and still expanding city. Xela is the name of the Old Quarter, built over a Mayan town in the 16th century, with its cobbled streets and prettily painted homes remaining almost unchanged for a hundred years. The magnificent colonial buildings and Central Park are here within this historical and very walkable part of the city. Known as the Parque Centro, this pleasant green space serves as the central plaza and the focus of the city, being surrounded with fine and elegant neo-classical architectural attractions and set in the heart of the Old Quarter. Founded in the 19th century and originally landscaped as two adjoining parks with a noticeable Italian theme, the Central America Park was revamped in the 1930s, when the parks were joined together. This busy plaza is the city's principal meeting place and the venue for many sizeable cultural events, with its plentiful seating, ornamental stone columns and Templo Abesta. The restaurants and bars around its perimeter offer great dining, while musicians entertain nightly and the grand buildings are illuminated when the sun sets. This spectacularly designed building is set on the north-eastern boundary of the Parque Centro and is the municipal building for the city. Inaugurated in 1895, the neo-classical style was regarded as a symbol of culture in this wild mountainous region. Surrounded by vast swathes of greenery and massive trees, the Town Hall was rebuilt in 1903 after a massive earthquake struck the city the year before. Just a stroll away, the Edificio Rivera is an additional neo-classical highlight and well worth checking out if you are in the vicinity. Quetzaltenango's Municipal Theatre is yet another stately neo-classical pile, built in 1892 and recently restored at enormous cost. Located on the northerly side of the city centre, its imposing presence is host to many cultural and theatrical performances, as well as regular jazz concerts. For those who wish to explore its beautifully decorated interior, the theatre is open outside of performance hours. Each year in September, the prestigious Floral Games of Central America (Juegos Florales Centroamericanos) awards are held here. Just across from the Teatro Municipal, construction of this attractive theatre commenced in 1898, but was actually only completed in 1931, at which time it opened as Guatemala's first cinema. Around ten years ago it was restored as a theatre and now has a seating capacity of 1,400 people, being regularly filled for both plays and jazz concerts. The building itself is only open for performances. This massive, magnificent structure is reminiscent of many Western neo-classical museum buildings. Following the triumphant Liberal Revolution, the Casa de la Cultura was built over the cemetery of the Espiritu Santo Church in the 1870s as, oddly enough, both a prison and a warehouse for flour, and was renovated in 1955 and reopened as a centre for culture. Nowadays, it hosts a variety of cultural events and concerts in its auditorium, has a fine library (the Municipal Library), and is home to the small Marimba Museum and the popular Natural History Museum, complete with fossils and stuffed animals. This exquisite covered arcade, with its delicate glass roof and imposing archway, was built in 1899 by order of the owner of the house at its rear, John Enriques. Located on the western side of the park, the Pasaje Enriquez has massive marble columns and a painted portico leading from the street. Through the archway are several travel agencies, as well as a number of cafes, language organisations and a trendy bar, all constructed in the same style. Located approximately 2 km / 1.5 miles to the north-west of the Parque Centro America, the Parque Zoologico Minerva stands on the Avenida Las Americas and is a very reasonable family attraction, particularly if you are holidaying here with young children. This zoo park has a real assortment of animals and exotics, such as coyotes, deer, grey foxes, jaguars, monkeys, raccoons and birds of prey, as well as a playground area and some fairground-type rides. However, it is quite clear that the zoo is run on a small budget, so don't arrive expecting to find something wonderful. Worth noting, close by on Calle 4a is the Templo de Minerva.